Archive: 105. Witch Hunt. Intermission: Sugar Substitute. 104. Fair Game. Intermission: Grave Concern. 103. It’s All in the Mind. 102. Escape Route. 101. Mutual Assurance. 100. High Expectations. 99. PDA. 98. Moments Apart. Intermission: Everyday Life. 97. After You. Intermission: Cut Short. 96. Unspoken Rule. Intermission: Test Dummy. 95. Love Again. 94. Model Girlfriend. 93. Clean Slate. 92. Table for One. 91. Dial Tone. Intermission: Ice Block. 90. Golden Hour. 89. Guest of Honor. 88. Class of 2008. Intermission: Casual Outing. 87. Boy Toy. 86. Trapped. Intermission: Textual Harassment. 85. Total Recall. 84. Scenic Route. Intermission: Test Drive. 83. Small Fry. 82. Local Area. Intermission: Love Note. 81. Take Heart. 80. Happy Hour. 79. Critical Hit. 78. Safe Boundaries. 77. Study Buddy. 76. Leaving Home. 75. Breaking Up. 74. Curtain Call. 73. Ten Seconds to Midnight. 72. Buddy System. 71. Just Beautiful. 70. Piece of Cake. 69. At Loose Ends. 68. December. 67. Fade Away. 66. On Our Own. 65. Carry Me. 64. Call Waiting. Intermission: Raw and Uncensored. 63. Pillow Talk. 62. Feline Filibuster. 61. Rehearsal. 60. Mischief Night. 59. Mother’s Day. 58. To The Top. 57. Up to Bat. 56. Molly’s Adventure. 55. Back and Forth. Intermission: Sensible Precautions. Intermission: Turning Tides. 54. Casting Call. 53. Another Shoulder. 52. Unrequited. 51. A Distance Apart. 50. Wonderland. 49. In the End. 48. Pick Me Up. Story Summary: Starting Over. 47. New Beginnings. 46. Return. 45. Intervention. 44. Search and Rescue. 43. Arrival. 42. Invitation. 41. Moving On. 40. Love My Way. 39. Rising Temperature. Intermission: Birthday Double-Team. 38. A Different Side. 37. Crash and Burn. 36. Under Pressure. Intermission: Hydrothunder Tantrum. 35. Tread Carefully. 34. Bonding. Intermission: Box of Tricks. 33. Onwards to Adventure. 32. Follow Me. Intermission: Break Time. 31. Carry On. Intermission: Wishful Thinking. 30. Troubled Waters. 29. Mid-term Time. 28. Feline Festivities. 27. Of Little Monsters and Pockets. Intermission: Lucy’s Birthday. 26. Misunderstanding and Change. 25. Left Behind. 24. Unmerry Melodies. 23. Humble Approach. Intermission: Daisy’s Birthday. 22. Wardrobe Malfunction. 21. A New Leaf. 20. A Difficult Choice. 19. Enter High School. 18. Hot Pursuit. Intermission: Yashy’s Birthday. 17. Blurry Memories. Intermission: Mike’s Birthday. 16. Farewell, Middle School. 15. Unfulfilled Fantasy. 14. Field Day. 13. Aftermath. 12. Confrontation. 11. Puppy Love. 10. Off to the Movies. Intermission: Catty Remarks. 9. Pep Rally. 8. Show and Tell. 7. Helping Hands. 6. Prom Preparation. 5. The Burden of Parenthood. 4. Unfit for Education. 3. Merry Snow Day. 2. Gaming Rivalry. 1. Simple Pleasures. Veronica: It’s pretty mindblowing to get to a storyline I did in the original comics when I was 11-12, only this time it’s something that happened in the background. 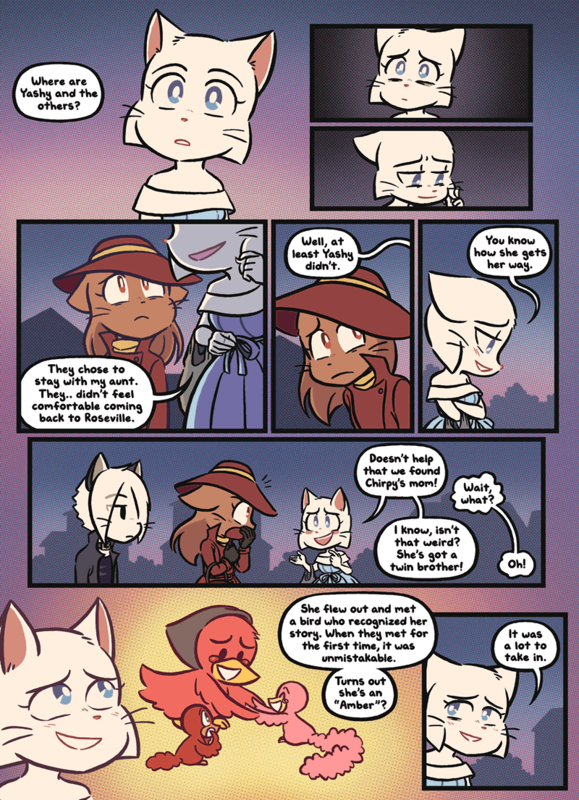 Chirpy never stuck around forever, or rather she became an irregular visitor to the group because she got reunited with her mother and brother eventually. SO MUCH ANCIENT CAT LORE. We want to email you some comics! Join the thousands of BCB fans who look forward to an email of cat drama every Monday morning, and we’ll send you a dozen “Ships Ahoy” comic strips, and one every week after that! We’ll send a link to the comics you missed, straight away. Beauty is subjective. They’re all queens.-Truth be told I think the majority of ‘who’s hot and who’s not’ originates from Paulo most of the time and when it comes down to it there really hasn’t been a person he hasn’t been attracted to in terms of looks, just personality. All the girls are attractive in some way, even Sue who Paulo does not get along with he saw as attractive but her tendency to come off as a bit of a ‘smart-brat’ was a turn off.Lucy is supposed to be considered glamorous by Mike and Paulo, but on Mike’s side of the fence he’s gotten her confused multiple times with Sandy, who’s supposed to be a textbook model. We’ll look for your comments and highlight our favorites on the homepage. BCB Store Books and trinkets! 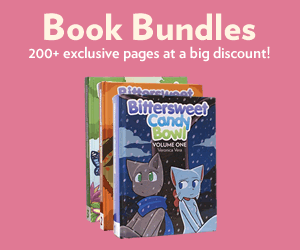 BCI Membership 260+ bonus pages! Knows a ton of spoilers. BCB’s official blog: author Q&A, outtakes and more. A Tumblr askblog featuring the whole cast. Oliver’s blog goes behind the scenes.